Moroccan Cuisine is amazingly flavourful, colourful and healthy. This vegetarian soup is hearty and satisfying, while blending mellow sweetness with an underlying earthiness from the cumin. The combination of cumin and carrot is a classic and this soup really play upon that flavour profile. One thing I change up is the addition of farro, which bring some nice thickening starch to the soup without adding gluten. 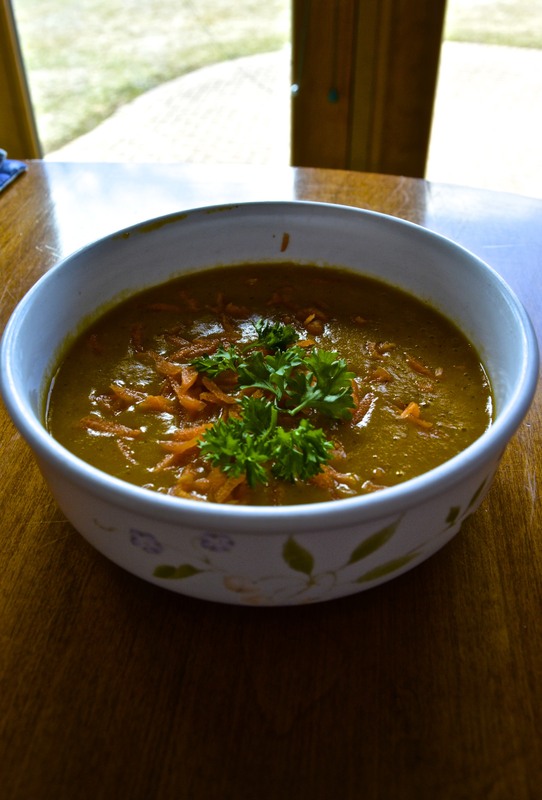 Also try this soup cold for a totally different yet amazingly satisfying experience. Enjoy! There is an important step to this soup and it starts before anything goes into the pot. What you need to do is take your carrots and put them into a mixing bowl, add some oil, salt and pepper and toss the carrots until they are coated. You then need to bring the carrots to your barbecue and roast them until they begin to blister. You want to get a little bit of carbonization on the carrots while the roasting intensifies the sweetness and carrot flavour. Remove the carrots from the grill and bring them back inside. In an oiled pot on medium heat, toast your cumin seeds until they begin to really release their aroma. Then add your onions and some salt, and sweat the onions down. Then add your garlic and roasted carrots. Continue to cook this all down for as long as you can before too much of the contents begin to stick to the bottom of the pot. Add your butter and try to get all of the fond off the bottom of the pot with the moisture of the butter. After about 15 minutes of cooking everything together add you brother and scrap the bottom of the pot to release the big flavours which have been left. Bring the soup to a boil, add your farro and then lower the heat to simmer and cover. You want to simmer the soup for about 2 hours. When that is done remove the soup from heat, let cool and then using an immersion blender to blend the soup until smooth. Serve the soup with a squeeze of lemon, some grated fresh carrot, all spice and parsley. This entry was posted in Cooking, Food, Food Reviews, How To, Photography, Photos, recipes, Uncategorized and tagged african cuisine, carrot soup, Cooking, cumin, eating, Food, moroccan cuisine, recipes, soup, vegetarian cuisine. Bookmark the permalink.